As promised here's a rundown of Week 4... It started out bad, horribly bad. How bad is that you ask? Try 2-8. Yeah 2 wins 8 losses. Now some of that is me. But it turns out a lot of it was my warrior partner. He had regemmed for STR from Armor Pen. Well folks I can tell you that even after the armor pen nerf your warrior should stick with it. Tuesday night my warrior is crying out in dismay on why he's critting clothies for 1-2k damage. I'm crying out because of a new humongous 21 second CD between stuns....the rating tanks from 1807 to 1778.... I call it after 10 games in disgust and go pick up my Relentless Gladiator Cloak of Dominance before the rating slips under 1750 and I become ineligible. We hit it again last night playing 22 games. Jeddak has regemmed to Armor Pen and is critting for his more usual 3-5k again. We end up going 11-11 and the rating goes up slightly to 1787. We went up and down quite a bit with a low of 1740 and a high of 1797. So what does this mean for Prot/Warror 2's? #1) The warrior needs to stick with arm pen. I dont' have the math or theorycraft but I have a combined 30+ arena matches this week with Jeddak CLEARLY saying arm pen is better. He'll also be picking up a mace next week for an added 15% arm pen on top of that. He's talked to a couple top level warriors on our relm about it and they all agree...even after the nerf if you have the Attack Power already (say 4k) stick with Arm Pen. #2) I'll be sticking with Protection in 2's. We're more or less maintaining in the high 1700's - low 1800's in 2's. This is much higher then the low 1600's I was doing last season as Holy Spec. Ardent Defender (reduces damage taken below 35% health by 7/13/20% instead of 10/20/30%.) - Well I'm sure this is affecting me, but at the end of the day it's not feeling like I'm dying to much quicker so I'm calling this a minimal nerf to my play style. Touched by the Light: ( provides 20/40/60% of the paladin’s strength as spell power instead of 10/20/30% of the paladin’s stamina.) - Surprisingly very little noticeable difference here. This change dropped my spellpower by about 400 but between the mace and cloak upgrades I actually only lost 135 spellpower from last week, and with the huge crits provided by Sacred Shield I'm still spamming FOL quite successfully. OK THIS IS THE HUGE, UGLY, KEYBOARD BANGING, VENT YELLING, MOUSE THROWING nerf. It's MUCH worse than even I feared. out of the 19 losses this week, I can attribute at least 9 to having my HoJ a few seconds off cooldown giving a healer that one big heal to get back up to 50-75%, effectively resetting the mach. OR not being able to stop a nice long 10-15 second chain CC because I couldn't stun back. It's so frustrating seeing what would have been a win last week turn into a loss this week, specifically about this nerf. The problem is that with both stuns on the same 30 second CD timer you now have a full 21 seconds of nothing between stuns. This is up almost 100% from the 11 seconds between stuns we had before the patch. I've even put a post up on the pvp forums requesting the HoJ stun to be reduced to 25 seconds from 30. You can see the article (and my logic) here. Yeah I don't expect much sympathy but this is such a big nerf it's just crazy. BOTTOM LINE: Prot isn't going anywhere in 2's. The excellent mana regen and heals are still there, the CC is sort of there, and (so far) it seems to still be working. I can't stand up right now, because blizzard just shattered my knee caps with their NERF bat. Ardent Defender: This talent now reduces damage taken below 35% health by 7/13/20% instead of 10/20/30%. I was hoping for at least one more week, but clearly I'm not going to get it. What does this mean to me, well clearly it's going to be harder to stay at a high ranking. Not only is this set of stuff a huge nerf, most other classes are getting buffed!?!?! No one's surprised about these nerfs coming, even I know a little something should change. But the loss of roughly 400 spellpower is hard to swallow. However, one can make up some of that with gear. Loosing 10 seconds of cooldown on a stun however, that's just unpleasant. I'm unclear on how much the Ardent Defender change is going affect me. At the end of the day we'll see how the rating goes. I should be hitting some games tonight so we'll see what happens. That's right folks, Jeddak and I hit 1807 in 2's last night. I immediately called a stop and let the points roll in on Tuesday. That means on Tuesday I'm going to have a nice shiny Relentless Gladiator's Gavel !! What a huge update from my current Titansteel Guardian. 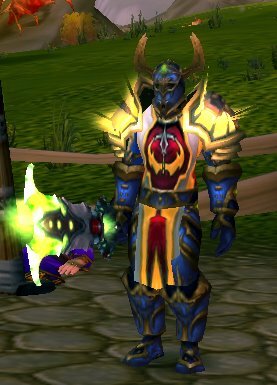 I owe it all to a decent partner and the Prot/Holy spec 19/52/0. This spec is insane, with two available stuns on short cooldowns and excellent survivability. Considering that our win percentage last night was 75% (15-5) with gear upgrades I'm thinking 2k might even be possible for the first time ever!.... At least until the nerf comes thru. He's Shadow! ... Now I haven't seen a shadow Priest in arena since climbing out of the 1500 bracket and I'm not very familiar with their spells. But but I pop Hand of Freedom on Jed yell at Jed to wail on the guy. I use both of my stuns to lock him up and he's almost dead... to easy! BUT WAIT... he turns into a purple ball and is basically immune to Jed's attacks. So Jed switches to the rogue. Suddenly the priest reverts back to his normal form and we start taking a lot of damage, my stuns aren't up yet - the rouge is back at 100% health and I'm thinking OH NO don't screw this one up! Jed hops back on the priest and combined with HoF and my 2 back to back stuns we have the priest dead shortly. Wrap up the rogue and it's 1807 team rating! Next time I'll talk about one of our problem comps (Warlock/Healer) and how to beat them. So you may have read that 2v2 is dead. Blizz has mandated that only 3v3 and 5v5 teams will be eligible for a Gladiator title and weapons. They will also not balance around 2's. This has effectively killed off the 2v2 bracket with everyone rolling 3's teams, right? WRONG! In fact almost nothing has changed. What do you say Drunkenclod? Have you been hitting the alcohol particularly hard this morning? In it you'll see roughly 2,200 active 3's teams back in Season 6.... How many are active today? 2,125 !! SAY WHAT?!? How can this be? Everyone says 2's has died. Why is this? All but 2,200 rated gear is available in 2v2 play, points earned are the same and on the blizz forums (unofficially at this point) it seems that titles EXCEPT for gladiator will still be awarded. So if you were playing arena in S6 at under 2k keep on PWNing and getting PWNed in S7 - Everyone else is! Ever get tired of plugging numbers into the amory? I sure do. Here's a little cheat sheet on all brackets from 1500 - 2000. Since now fifteen hundred is the lowest points you'll get as long as you play ten games a week you'll get points as if you rated at fifteen hundred. I've also done three color codings, green, red, and blue.... This is based on the full 5v5 points given. So you can see that in order to equal the (roughly) same amount of points in 3's team as a bottom rank 5v5 team you'll need 1550 or in 2's team you'll need 1600. I find that to be beneficial for me for time managment. If I know I'm getting 344 points for 5's this week and there's no way I'll be able to get 1550 in 3's I can skip it since I'm already getting more points- make sense?